Sibylle von Olfers was a German children's book author and illustrator. Sybille von Olfers' blend of natural observation and use of simple design has led to her being compared to Kate Greenway and Elsa Beskow. She is best know for her book The Story of the Root Children. 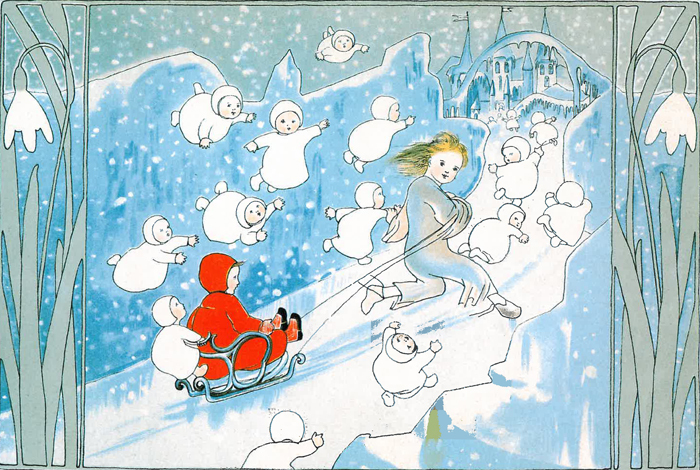 In her short life, Sibylle von Olfers wrote and illustrated ten children's picture books which have delighted children for generations. Sibylle von Olfers was born on the 8 May 1881 in the Castle of Metgethen in East Prussia. Her parents were Ernts Friedrich Franz Gustav Werner Marie von Olfers and his second wife Olga Maria Bertha Freiin Behr. His first marriage was to the older sister of Sybille von Olfers' mother. Sibylle von Olfers was the third of five children and her full name was Maria Regina Angela Hedwig Sibylla von Olfers. Sibylle von Olfers led a sheltered childhood and she and her siblings were educated by governesses and private tutors. However, her grandmother wrote that in the early stages of her education, Sibylle von Olfers did not pay much attention to her lessons, as she preferred to amuse herself with fantasies and games. Sibylle von Olfers revealed her passion for art early on and began writing and illustrating picture books for her little sister with whom she was very close. These picture books entertained and delighted the whole family. Sibylle von Olfers' aunt, the writer and painter Marie von Olfers, supported her interest in art. She taught Sibylle von Olfers how to draw and paint plants and animals and Sibylle von Olfers would spend hours at a time drawing in a corner of the palace gardens. At the age of seventeen Sibylle von Olfers went to stay with her aunt Marie von Olfers in Berlin where she trained at art college. As a child, Sibylle von Olfers displayed a quiet, childlike piety and would pray in front of self-erected altars surrounded by candles and drew images of Madonnas and saints for her little sister. Sibylle von Olfers grew up to be a beautiful woman, attracting many admirers and suitors, but she remained aloof and distant from the 'useless world of the aristocrats'. In 1906, at the age of twenty-five Sibylle von Olfers joined the Sisters of Saint Elizabeth, an order of nuns, much to the dismay of her parents. She took the name Sister Maria Aloysia. After two years Sibylle von Olfers was sent to work as an art teacher at a Catholic primary school in Lübeck. In addition to her work she continued her artistic training at art school, mainly copying the works of Italian masters. Sibylle von Olfers painted her first altar pieces for the Sacred Heart Parish in Lübeck, some of which are still well preserved. Sibylle von Olfers became ill with a lung infection and a stay at a spa in Gardone temporarily alleviated her disease. The outbreak of the First World War forced Sibylle von Olfers to return to Lübeck where she was able to continue her work until Christmas Day 1915. Her lung disease returned and Sibylle von Olfers died four weeks later, on the 29 January 1916, at the age of 35. Sibylle von Olfers is known for her natural observations and simple design in the art nouveau style. Her illustrations are in earthy tones and reflect the changing seasons. 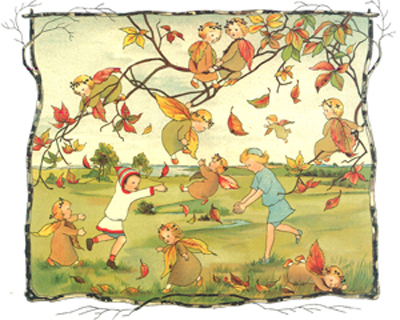 Her illustration style has led many to compare her to Elsa Beskow and Kate Greenaway. 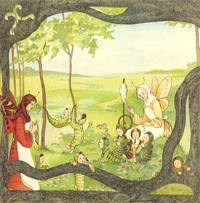 Sibylle von Olfers wrote and illustrated 10 children's books. Below is a list of her books. All through the winter the Root Children are asleep underground, but when spring comes Mother Nature wakes them up. Then the Root Children are busy cleaning and painting the beetles and bugs. When summer comes they play in the fields, ponds and meadows. The Story of the Root Children is Sibylle von Olfers' best-known book and is available in several formats including a mini gift edition and as My First Root Children, a board book for very young children. When the hunter's children fall out of their cradle in the woods, a kind mother rabbit takes them home and cares for them. She makes them rabbit suits to keep them warm and they play happily with her rabbit children. Little Billy Bluesocks is a fun-loving little boy who goes through the day doing tasks that all children will enjoy. He wakes up, plants a seed, feeds the rabbits, plays on the seesaw with his dog, picks apples, has a delicious supper and finally goes to bed. The princess lives in a castle in the forest. Every morning the Dew children help to get her dressed, and comb her golden hair. Little moss children bring her a delicious forest breakfast, then she practises her writing with Mrs Crow, her teacher. The Princess plays with her animals friends, the deer, hares, squirrels and birds, before telling stories to the mushroom and toadstool children. Finally, the star children light her way to bed. George is playing with his boats, but there's no wind to make them sail. 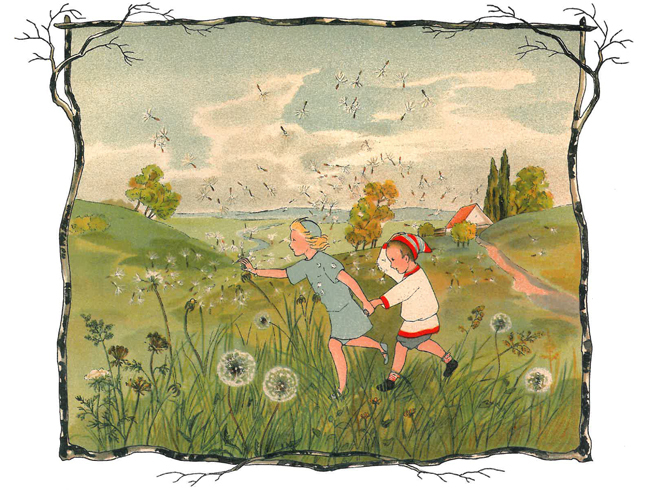 Then one of the wind children comes and blows especially for him – and together they embark on a great adventure. The wind child blows dandelions in the meadows, shakes apples from the tree and blows the leaves around and eventually she blows George home on a cloud. Far far away, the butterfly folk live in a kingdom of beautiful gardens. The butterfly children play, dance and sing all day long with their little brothers and sisters, the caterpillars. The children can't wait until the first day of spring, when they will finally get their wings. But first, they must learn about the many brightly coloured flowers in the kingdom, so they can take part in the flying procession of peacock, swallowtail, red admiral and many other butterflies. King Lion is having a feast. All his animal subjects bring their favourite meal – saltwater lemonade from the fish, snail sausages from the hedgehog and thistle salad from the donkey. But which dish will King Lion like the best? This tale from the animal kingdom is told in lively rhyming verse. 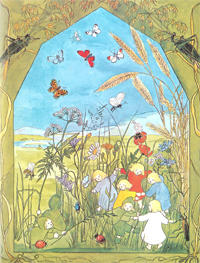 We've got more children's authors and illustrators you'll love: visit our Elsa Beskow Author Page and Astrid Lindgren Author Page for more wonderful picture books.